Partula snails were driven to extinction in the wild by introduced predators. In 1977, on the islands of French Polynesia, government authorities released a predatory snail. They hoped this introduction would effectively control another species of invasive snail, previously introduced to supply escargot. Instead, by the early 1980s, scientists reported alarming declines of native snail populations. Within ten years, 48 native snail species (genus Partula) had been driven to extinction in the wild. 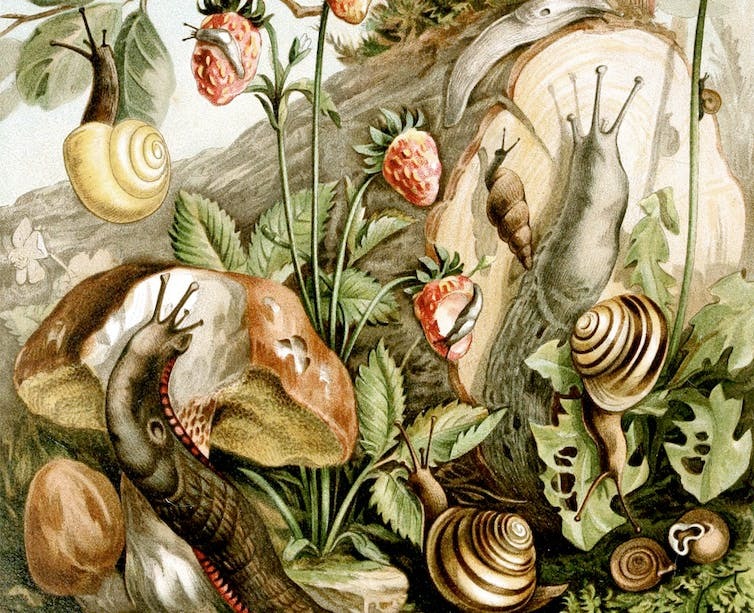 The extinction of the Partula is notorious partially because these snails were, before going extinct, the study subjects of the first test in nature of Darwin’s theory of evolution by natural selection. In the decades since, attempts to control and eradicate invasive species have become common, generally with far better results. However, our paper, published today in Nature Ecology and Evolution, highlights the importance of scientific evidence and independent assessments when deciding whether to control or eradicate invasive species. Increasingly, large-scale invasive species control initiatives are being proposed worldwide. As early as 2018, a herpes virus will be released in Australia’s largest river system, targeting invasive common carp. As part of its Threatened Species Strategy, Australia is also planning to kill two million feral cats. Across the Tasman Sea, New Zealand has made a bold commitment to remove three groups of invasive predators entirely by 2050. New Zealand looks to eradicate three groups of invasive predators: rodents, mustelids, and the common brushtail possum. It’s not just Australians and Kiwis making ambitious invasive species control proposals: bounties are being paid to catch invasive fish in the United States. The European Union has blacklisted 37 species of plants and animals within 4 million square kilometres, many of which are well-established and will be targeted by control (not preventative) measures. Meanwhile, new gene editing technology has made the continental-scale eradication of invasive species a real possibility, for example by implementing gene drives that reduce breeding success. If you haven’t heard of it, CRISPR is a startling new biotechnology that makes genetic modification of plants and animals much easier. It offers new potential solutions to some of the world’s worst environmental, agricultural and human health problems. These schemes will be implemented across large and complex social-ecological systems, and some options – like releasing a virus or genetically engineered species – may be irreversible. While these projects may yield great benefits, we must be aware of the potential risk of unexpected and undesirable outcomes. A prime example is the project to remove invasive carp from a million square kilometres of Australia’s rivers. Some scientists have expressed concern about the potential for the virus to jump species, and the effects of having hundreds of tonnes of dead fish fouling waterways and sapping oxygen from the water. The CSIRO and those planning the release of the virus suggest it is safe and effective. Despite extensive media reporting giving the impression that the plan is approved to go ahead, the National Carp Control Plan has yet to publish a risk assessment, and is planning to deliver a report in 2018. Removing well-established invasive species can create unforeseen consequences. 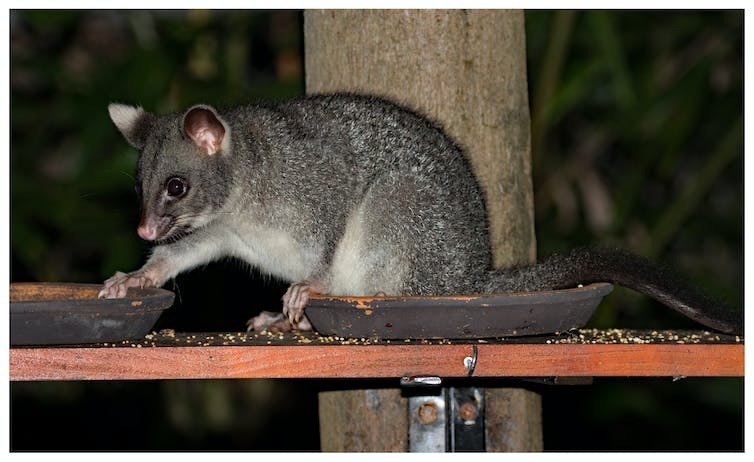 These species can play significant roles in food webs, provide shelter for native animals, support ecosystem services, and their sudden death can disrupt ecological processes that are important to native species. For example, a large amount of time and effort was spent in removing the non-native tamarix (or “salt cedar”) in the southwestern United States, because of the belief it was harming the water table. Yet, subsequent research has indicated that the negative effects of tamarix have been exaggerated. In some areas, the plant is actually used by large numbers of endangered flycatchers to nest and fledge their young. 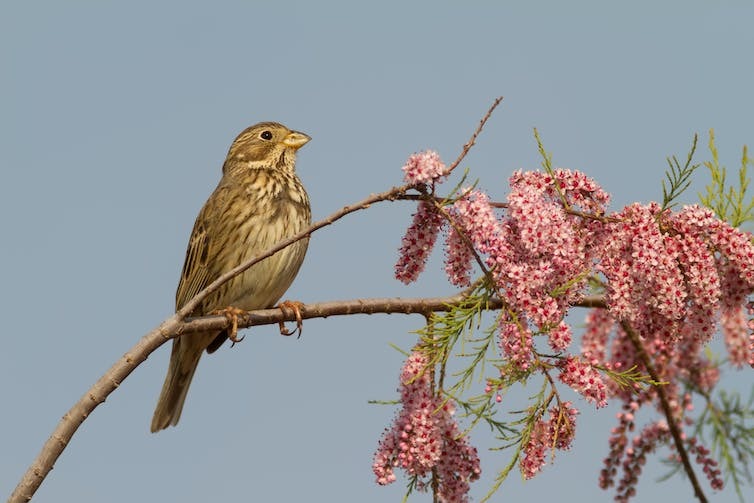 A corn bunting perches on a blooming tamarix. In our paper, we highlight a series of considerations that should be addressed before plunging into large-scale invasive species control. Fundamentally, there must be a demonstrable ecological and social benefit from control or eradication, above and beyond the purely ideological. At first this might seem facile, but invasive species control initiatives are often highly politicised, with science taking a back seat. Given scarce funding for conservation, it is crucial that resources are not squandered on programmes that may not deliver – or could cause environmental damage. We must avoid assuming that attempting to control invasive species will, by default, solve our environmental problems. This means addressing the full range of human pressures which negatively affect biodiversity. We must also consider how removing an influential invasive species could benefit other invasive species, harm native species through increased predation and competition, or alter ecological processes or habitat. Comprehensive risk-benefit assessment of invasive species control programs allow decision-makers to proactively avoid, manage or accept these risks. For example, tonnes of decomposing carp post-virus may cause short-term water quality issues, or the death of native species. Ultimately, however, these risks could be acceptable if the virus is effective, and allows native species a window of opportunity to recover. Large-scale invasive species control demands careful investigation of the risks and rewards. We hope our paper can provide policy-makers with better guidelines for science-based decision-making.